Jason Stookey is the vice president of partner development for the International Legal Technology Association, also known as ILTA. He’s a sales and business development professional with more than 18 years of experience in the tradeshow and event industry with a proven track record as an achiever in developing strategic and profitablerelationships. 22,000 members strong serving CIO, IT leaders typically in law firms, corporate council and the like. He also ran sales and business development for the National Association of Broadcasters, the NAB. Jason Stookey: I’ve been in sales and business development for 21 years. Got started in a small trade show organization that specialized in doing events in Russia and the former Soviet Union. This was right after the fall of the Soviet Union and we specialized in actually going outside of the Mosque of Saint Petersburg corridor and believe it or not, my first business trip was to Siberia. I went to a city called Novosibirsk for 5 weeks so it was definitely an eye opening experience and it definitely toughened me up pretty quickly. I work with the International Legal Technology Association, a non-profit organization that specializes in sharing best practices, education and various pieces of information to CIO’s, IT directors of the legal community. Our members consist of CIO’s, IT directors and anybody who’s involved in technology for the legal industry. The legal industry as a whole is very conservative and with technology expanding and innovation happening at such a rapid pace, you could say that the legal industry is being moved forward kicking and screaming but there’s really some exciting technologies that are going to disrupt that industry. Such things as artificial intelligence, block chain are coming in and it’s a great time to be involved with it as there’s a plethora of new companies that we need to introduce into this community. From a sales perspective, there’s a lot of blue ocean opportunities so it’s really exciting right now. Fred Diamond: Jason, I have a quick question for you. You’re right now selling for a not for profit, for a trade association. How does that differ from a for profit organization? Jason Stookey: Almost no different than selling in a for profit environment. We have goals, objectives, revenue, metrics that we have to achieve. The one nuance that comes up in a non-profit environment is you do have to take into consideration the needs of the membership at the end of the day where we don’t have shareholders or investors or private equity to be accountable to, we have to be accountable to the membership and so we need to always be conscientious that what we are doing is serving the overall mission of the organization. What I do specifically and what I’ve been involved with specifically in the non-profit sector really does focus at the end of the day on advertising opportunities, whether that’s in events, print publications, digital advertising or somewhere in between. But again, it’s virtually the same as working in a for-profit environment. Fred Diamond: So you have a number, you have a quota, pretty much? Jason Stookey: Absolutely. You would walk into the sales organization from the outside and recognize it immediately as being the same. Now that said, a number of non-profits do struggle with creating successful sales environments but I’ve been fortunate through my career to be involved in associations that have highly successful, well-oiled run sales organizations. It’s from my perspective, very different and I’ve worked in the for-profit advertising sector as well and as I said, it’s virtually the same. Fred Diamond: Very good. Give us a little bit of a peek into your career. How did you first get into sales as a career? Jason Stookey: Like everybody. I knew from 5 years old this is exactly what I wanted to do – I’m kidding. And he said, “I sell trade show space.” And I said, “I don’t know what that is, but can you get me a job?” He said, “Can you send me a resume?” And I said, “What’s a resume?” [Laughs]. A little tongue and cheek there, but sent him my resume and sure enough he introduced me to my first job and that was the one that I referenced earlier about doing events in the former Soviet Union. I was kind of a Jack of all trades position but it morphed over time into being responsible for selling exhibition space and sponsorships for that event. Not a well-planned out strategy to get into sales but once I got into it, I started to find out I enjoyed it and then I got successful and it just kind of blossomed from there. Fred Diamond: What are some of the things that you learned from those first jobs? You mentioned that you spent your very first job in Siberia, ladies and gentlemen, for five weeks. Tell us some of the things that you learned that have stuck with you. Jason Stookey: Primarily those early days I had to be self-taught in terms of sales technique and training, and so I would go to various events or lunch and learns and I was always going seeking a silver bullet – the thing that would make me successful 100% of the time on every sales engagement. That obviously doesn’t exist but through that I learned new techniques and started to learn on my own probing questions, startling statements, learning to create unique selling propositions and formulated probably at the time a little bit of an unorthodox style but I just kept refining it on my own. Then realized that I was much better in person and face to face than I was over the phone and so if I had an opportunity to set an appointment and get a meeting back in those days, it was primarily going to other trade shows and events, I found that I would be much more successful in that capacity. Fred Diamond: Tell us about you specifically. What are you specifically an expert in? Tell us a little more about your specific area of brilliance. Jason Stookey: I’ve been fortunate to be associated in the technology space for the better part of 17, 18 years and that started when I joined the Consumer Electronics Association, now the Consumer Technology Association. They’re the producers of the Consumer Electronic Show. I got to know technology on a first hand level and understand the sales channels and the needs and objectives of that community and was able to parley that to my time at the National Association of Broadcasters where it’s a lot of the similar brands but serving different markets. You understood the rhythm, the cadence and the needs of that community in terms of marketing and how they’re trying to build market share, grow their revenue, what their distribution channels are, what their challenges are and through that became very good at consultative selling. Being able to take people down a natural path to create a solution that met their needs. I don’t consider myself a stereotypical sales person in the sense that I don’t have to talk a lot, I don’t have to be loud and boisterous but I listen really well and I focus on key words, being able to relay that back to the customer and help go through the process of thinking with them through their challenge we can come to a solution at the end of the day that meets their needs. Just to summarize, I’m pretty comfortable selling into the technology space for Consumer Electronics but audio video equipment in general and then being very good at being able to take them through a journey. Fred Diamond: You mentioned that a lot of your career was in technology and one of your areas of brilliance is understanding technology companies and how they’re trying to provide solutions for customers. Now you’re at the ILTA, the International Legal Technology Association. Are the major vendors that you work with usual suspects, the Microsofts, the Ciscos, the Oracles of the world? Jason Stookey: Yeah, there’s definite opportunities for us to penetrate those companies. Yes, Microsoft is an obvious player that we work with. Some other ones that may ring a bell, LexisNexis, Thomson Reuters, those are HP, Canon, Konica Minolta. Again, I have a comfort level working with those companies because I understand the decision making process, how the budgeting process goes so it’s comfortable for me. Being able to work in those bigger, more complicated, corporate environments, I’m very comfortable with. Fred Diamond: Take us back through your career, we always ask the question about mentoring. Tell us about an impactful sales career mentor and how they impacted your career. Jason Stookey: Dan Cole was my vice president of sales at the Consumer Electronic Show in the early 2000, I think starting in 2001 and I knew of Dan through the trade show industry because he had a positive reputation and I actually had seen him speak at an industry event on sales training. When he came in, I was excited because I thought it was really going to bolster my skills and I would learn a lot from it. That couldn’t have been the furthest thing from the truth at the very beginning. Dan came in with a different style, put in some best practices, created what I would loosely call a level of regimentation that needed to happen and I felt that it did nothing but inhibit me. He was coming in trying to build a team and he had one person in particular that had bought into his system. Everybody else was fighting it and I finally went into his office and said, “I give up. I don’t know what you’re trying to do, just tell me what you want me to do.” And we ended up having a very cathartic, two hour conversation and we spoke freely and from there it just started to build a level of trust and support. That was when I learned it’s as much about the sales technique as it is to building a successful sales team where everybody’s bought into the same vision and program and rowing in the same direction. I would say that that was a pivotal point in my career. I always talk to Dan about it to this day, we talk on a frequent basis and he still makes fun of me coming in as a snot-nosed kid and saying, “Just tell me what you want me to do” because I was at a point of frustration. Dan’s definitely one of the most impactful people on my career. Fred Diamond: That’s great. Dan’s the VP of sales at Hargrove Inc.. We did have him on a previous podcast, he gave a lot of great sights and he’s also introduced some people to the Sales Game Changer community that we will have on future podcasts as well. Jason, what are the two biggest challenges you face today as a sales leader? Jason Stookey: I would bucket them into sales motivation and then lead generation. Lead generation in the sense of going out and engaging people who may not be familiar with you or have not thought about why they should work with you and in today’s world where you are getting bombarded with email, social media, you never answer your phone, getting people’s attention is the most challenging thing. Getting sales people to understand how to cut through that clutter and deliver value in the statement that they are trying to convey right off the bat is a challenge. It needs to be done on a repetitive basis and you’ve got to continuously be engaging that and trying to find new business and coming up with new things that will get people’s attention. Definitely try to lead with value, lead with a piece of education, lead with something that that person would think, “Wow, I would benefit from talking to that person.” I’ve seen it a million times and I still see it today where people just, I like to say, vomit information in their very first engagement and it goes absolutely nowhere. I can see that in a face to face conversation or in emails that people write. You’ve got to get a quick nugget and build that trust and kind of go from there. Then from a sales motivation stand point, the challenge always is to find what is that button to push with that individual. It cannot be a one size fits all type of approach. Some people want to be challenged through financial rewards and we’re in sales, we all want financial rewards. Some people want recognition, some people want just to be left alone and be the silent hero. It’s constantly trying to figure those people out, understand what motivates them, get in their heads, be empathetic and push them along to success. And being patient [laughs] from my perspective, just because there’s a way that I would do it doesn’t necessarily mean it’s their style. Those are just a few things in a quick 30 thousand foot overview. Fred Diamond: You had mentioned when you had that conversation with Dan back when you asked them what should I do and you mentioned that the realization you had was that you’re building a team and if you think about the team, various people come to the game with different skills and different approaches. At the end of the day you want someone who’s bought into your vision. One of the challenges that we hear from the Sales Game Changers that we interview is alignment from the C suite to the sales management down to the field level sales people or the people on the phone, if you will. That definitely fits in with how do you ensure that everyone’s basically on the same bus, so to speak, and helping your organization achieve its goals. Jason Stookey: You set on something that’s very important there, the alignment within the organization. If you do not have that, especially in a sales leadership position where you’re not aligned with senior management and all the way through to C suite it can be a challenge and you’ve got to be conscientious of those people’s background. If they’re not necessarily coming from a sales perspective, you have to make sure that you are spoon-feeding the information in a way that they understand it because there’s a lot of predisposed biases about what sales does and they’re not necessarily true. I’ve had more than my fair share of conversations with people that ask, do they fully understand what sales is? Do they fully understand what we do? That’s important so from a managing up perspective as being a sales leader, you need to make sure you’re effectively managing up and communicating up the chain of command as well because otherwise, you’re going to get a little kink in your hose and it’s going to be challenging to work forward. I say that from experience. 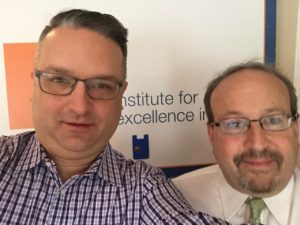 Fred Diamond: Just curiously, because a lot of the people listening to today’s Sales Game Changers podcast don’t really know the organizational structure of a trade association not for profit. Could you tell us for a few moments what does your reporting structure look like? Jason Stookey: Again, generally it’s fairly similar to a for-profit environment. In my current position I report directly into the CEO. Previous at National Association of Broadcasters NAB, I was a vice president sales and business development, reported into an executive vice president which in essence was the business unit leader and he had a sales leader, a marketing leader and an operations leader. Again, fairly similar to the for-profit environment. Fred Diamond: Jason, take us back to the #1 sale success or win from your career you’re most proud of. Take us back to that moment. Jason Stookey: It would have been when I was selling directly at the Consumer Electronics Association and I worked on Dan Cole’s team. Dan had implemented an annual sales contest called, “Winning the Annual Crown” and for three years in a row I came in second place to my good friend Kirk Smallwood. The only thing that we won out of this was a little glass trophy but I wanted that thing so bad, I buckled down on the fourth year and just did not stop and was relentless the entire year. At the end of December when I knew that I was not going to be caught, I clenched the annual crown. I went into Dan’s office and I said, “I got it.” And it was just off of a relatively small sale, I can’t even remember the company, quite frankly, but I remember the moment and then we would have a ceremony after the Consumer Electronic Show. When the show ended we would have sales team dinner when Dan would present that trophy and that was fantastic. I still share that trophy everywhere I go, it’s in my office right now and to this day I have one. It was for me, winning my own Super bowl and I beat Kirk Smallwood. Fred Diamond: Curiously, what did that signify to you? You talked about one of the two biggest challenges being sales motivation. Jason Stookey: It was a motivator. Not to sound arrogant, but I knew that the commission was all going to be there and even when I was coming in second, it didn’t mean that my commission was any less, I was doing really well but this was the icing on the cake. This was the thing that I wanted that validated me as being, in my mind, successful. I earned it and I earned it the right way, I just persevered through every single sales opportunity and didn’t turn anything over to an assistant. I drove everything home because I wanted that. That moment has lived with me and I try to convey that to my sales teams in some way, shape or form as I move forward. It’s not just about the money, it’s about the personal gratification of reaching that mountain top. Fred Diamond: Did you ever question being in sales after you made that decision to move in? Was there ever a moment where you thought to yourself, “It’s too hard, it’s just not for me.”? Jason Stookey: Candidly, no. Once I saw the light, it matched up very well with who I am. I was athletic in high school, played basketball, soccer, baseball and quickly learned that sales is very competitive and I liked the scoreboard aspect of it. Are there days where you’re in a drought and you’re just like, “This is ridiculous.”? Yes, but I can’t really remember going back and saying, “I don’t think sales is a career for me.” No, not really. Once I got in, I got hooked on the drug pretty deep. Fred Diamond: Jason, what’s the most important thing you want to get across to the selling professionals listening to today’s podcast to help them improve their career? Jason Stookey: For people getting into the sales profession, I’d go back first to what I shared earlier in that there is no silver bullet for sales. This is all going to sound very rudimentary but it’s true, there are no shortcuts in sales. You need to put in the time, the energy, you need to do the due diligence, you need to be methodical in your approach, you need to keep your pipeline organized at all time, you need to understand where there are potential peaks and valleys in your pipeline because you may have moments of glory but you will probably then fall off right into a valley or drought if you’re not bringing in leads behind it. Fred Diamond: What are some of the things that you do specifically yourself to sharpen your saw and stay fresh? Jason Stookey: I read constantly, especially in the sectors that I’m involved with. Make sure that I’m looking at trends and making sure that I’m aware of the new players into the market. Try to network with other sales professionals when I can, it’s easier said than done but I do get a lot of inspiration and oxygen when I have that ability to chat with people about their problems and just commiserate sometimes. In terms of actual skill sets, I need to do a better job at that, I could always be learning more but my typical style is to read. I was just reading about commission plans yesterday, different ideas, for example. My go-to is reading. Jason Stookey: At ILTA, I’m part of a regime change. We’re the new CEO, new VP of marketing, myself. I work with the vendor community as mentioned earlier on companies like Microsoft, LexisNexis, etcetera. There’s a bit of a chasm between the business vendor community and the rest of the organization so as a way to make sure that we’re serving the needs of this community better, I created what I’m calling the partner advisory council. It’s a group of 10 individuals from various levels of customers and we’ve created basically an n user group for them to share feedback on how we can better service their needs, create new opportunities, really get them to be part of the process. Their engagement deepens their commitment to our organization and it helps with the sales process when you have your customers selling for you. Giving them that sense of ownership helps and we’re starting to see some fruits blossom from that. Fred Diamond: Jason, as we’ve spoken, sales is hard. People don’t return your calls or your emails. Why have you continued? What is it about a sales career that keeps you going? Fred Diamond: Why don’t you give us one final thought to share with the listeners on today’s Sales Game Changers podcast to inspire them? Jason Stookey: I would say sales is the one career where you can really determine your lifestyle based on how much energy and effort you put into your work. I remember my grandfather who just passed away recently telling me at a very early age, two paths he suggested for me. One, he said, “If you want to be a doctor, be a radiologist, they don’t really have to talk to people very much and they don’t have to deal with all the blood and guts, but if you want to talk to people go into sales because you have an opportunity to influence people in a positive way, share value and reap some financial success out of it.” and I followed that path because I didn’t really want to be a radiologist [laughs] or a lawyer, for that matter. You can control your own destiny in sales and if you are a sales performer, you will always have an opportunity out there for you regardless of the economy or the market or what have you. If you find that in yourself and you stay in it, you will have a good life.